The water temperature at Lake Pleasant Wednesday topped out at 60 degrees, with morning air temperatures at 43 degrees. Guide Gary Senft targeted largemouth bass Wednesday — in 25 mph winds during the early morning. 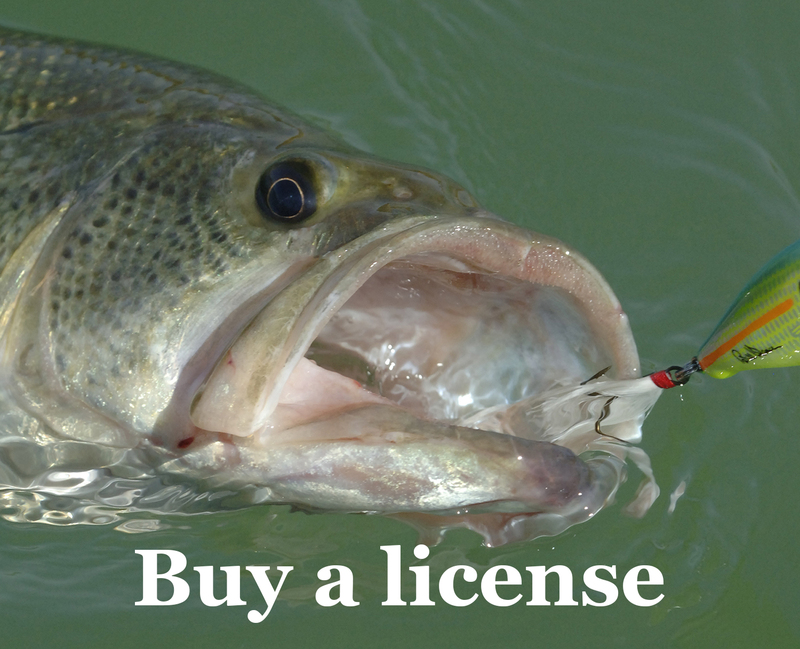 Fishing from 8:30 a.m.-3 p.m., he and a fishing partner caught 15 largemouth bass using dropshots, Texas rigs and Ned rigs. His primary success was targeting steep, rocky banks and using small baits. The wind began to die down around noon. He said the largemouth he caught were nice and healthy. He said he even caught a 3 1/2-pound channel catfish on a dropshot rig. November 28, 2018. 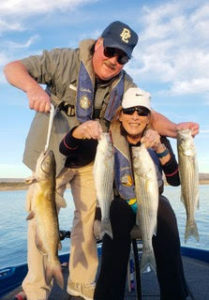 Dan & Sharon Robbins caught this nice 4-pound catfish and a number of nice striper on a modified dropshot rig using cut anchovies in 35-60 feet in the afternoon in the northern coves of Lake Pleasant. Monday, Nov. 26. 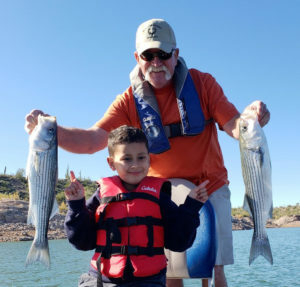 John Miller and his 5-year-old grandson Koa caught a number of nice striper just like these (above) using a modified dropshot technique and anchovies in water from 30 -65 feet. 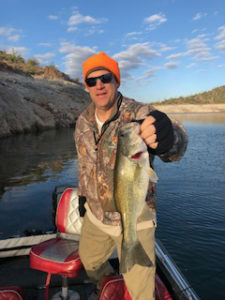 John S.: From the morning of Sunday Dec. 2 out at Lake Pleasant. Cool morning and some nice bass.